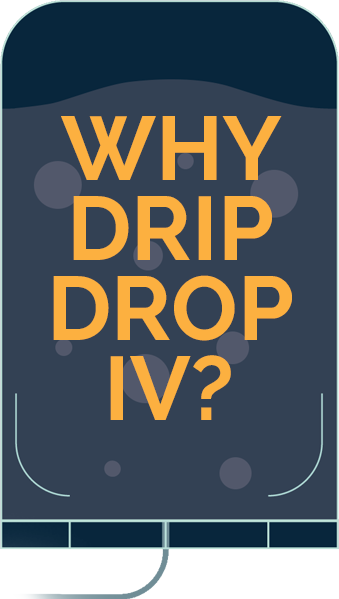 Drip Drop IV Vitamin Bar provides IV therapy with leading-edge customized vitamin, mineral, antioxidant and amino acid nutrients in a highly absorbable IV infusion, within a welcoming relaxed environment. Our services include IV drips, shots, boosters, wellness packages and memberships. Come enjoy your IV therapy experience and de-stress in our signature drip lounge. Can’t make it to us? We can come to you! Call to inquire about our Mobile IV Drip Service availability in the Austin metro area (requires 3-5 day lead time). IV vitamin therapy delivers vitamins and minerals directly into the bloodstream, which allows for maximum cellular absorption. Simply said, your cells receive their much needed nutrients more quickly and efficiently. Our caring registered nurses work with you to select or create a drip combination that will best help you achieve your wellness goals. All drips are custom-mixed at every appointment and administered with your comfort as our top priority. Optimizing your wellness has never been more accessible & comfortable. Schedule online, give us a call, or simply walk in during our business hours. We’ll be waiting to greet you! After a brief consult and a review of your medical history, our registered nurse will custom-mix your drip combination. Drips take 30-45 minutes to administer, giving you time to zone out with your headphones, grab a refreshing beverage while you work, or watch TV. * Premium Drip and Beauty Drip are not eligible for $99 first monthly IV Drip or Complementary Birthday IV Drip; however, a 20% discount for those drips will be applied for members. 3 month membership commitment required. Optimize your health & wellness with our IV drips, Boosters, and Shots. Our one-stop IV drip. All the benefits you could imagine in one combination. High-performance IV to support hydration, recovery, energy & reduce pain/inflammation. Contains B-Complex, Carnitine, Arginine, B-12, Zinc, MSM, B-2 (Riboflavin), Magnesium. Mega immune system boost for cold, flu & allergy prevention. Enhance your libido and relight the fire, in body and mind. Enhance your energy production, repair DNA, boost your mood, brain rejuvenation and aging gracefully. Contains NAD. Price dependent on dose. Prepared in 500ML fluid. Pick from a selection of B12, MIC/B12 & D3 shots. Take home packages available. Shots include MIC/B12, B12, B-COMPLEX, COQ10 and Vitamin D3. Vitamins and minerals to speed up metabolism and increase fat burning potential. Feel refreshed in mind and body. This IV supports the flushing and removal of toxins. Hungover and need a boost? Come get renewed, revitalized and functional again. The do-everything IV drip. This powerful antioxidant detoxifies, protects & energizes. Contains 1200 mg Glutathione (Call to inquire about higher dosing.) in 500ML of fluid. IV push available. Powerful antioxidant that is also anti-inflammatory, detoxifying, liver supportive, glucose balancing and rejuvenating to the skin. Contains ALA. Price dependent on dose, Prepared in 500ML fluid. Beauty vitamin formula that is collagen building & anti-aging. Ideal for hair, skin & nails. Essential nutrients for overall health enhancement. Feel energized and more alive than ever with this pick me up! Supercharge your immune system to keep you healthy & strong. Add a variety of boosters to your IV drips. Glutathione, Zinc, Vitamin C, Magnesium are popular additions. * IV drips comes standard in a 500ml IV bag. 1000ml (1 liter) IV bags available. These IV drips are not meant to diagnose or treat medical conditions. The IVs, Boosters & Shots are administered by a Registered Nurse and overseen by a Medical Director. Contact us for more information on how to customize your IV drip. Many people do not absorb vitamins in their digestive track very well. For those dealing with digestive issues such as constipation, chron’s, celiac, IBS it can be helpful to bypass the digestive track and go directly to the bloodstream for high absorption at a cellular level. We use very small needles as well as a very small localized numbing agent so you will feel virtually nothing. That being said, everyone has a different pain threshold. Some find it painless and others feel slight discomfort with the needle insertion. Most people find the IV infusion itself quite calming and relaxing. Some customers might feel some warmth as certain nutrients enter the bloodstream such as B vitamins or magnesium. Yes, vitamin IV therapy is very safe provided it is administered by a licensed medical practitioner and overseen by a Medical Director. We use high quality vitamins, minerals and amino acids sourced from certified suppliers. Also, IV therapy has been utilized for over 50 years and was developed by Dr. John Myers (the Myer’s cocktail). How often should I get an IV for it to be effective? Depending on your nutritional needs you may see dramatic effects after the first IV. People who get regular IVs will feel less dramatic effects as their body starts to obtain optimal hydration and nutritional balance. Some get an IV weekly, multiple times a week, several times a month or as needed. Most people notice an increase in energy levels and an overall health enhancing boost. Optimum vitamin and mineral levels support proper metabolism, cortisol levels, cellular health, mood, and good sleep patterns. Vitamin therapy can also be an immune system boost which is very helpful during the winter months and during allergy season. Is there an reason I should not do an IV? We believe IV therapy can be beneficial for a wide variety of individuals. We also inform our customers of the fact that we are not a medical treatment center and therefore we do not treat or diagnosis health issues. Drip Drop offers a supportive therapeutic health and wellness service. If you have a major health condition please consult with your doctor before obtaining vitamin IV therapy. Feel free to read up on our IV combinations and benefits. Make an appointment online or by phone or drop in for a Drip Drop. If it is a small group we request that you schedule an appointment online or by phone. Is there anything I should do before arriving? For best results drink plenty of water and have a little food in your stomach before arriving. A cancellation must be made a full 24 hours prior to your scheduled appointment. Cancellations with less than a 24-hour notice or missed appointments will be charged for the amount of the scheduled appointment. There is no charge for a rescheduled appointment. *If you schedule an appointment within 24 hours and need to cancel, call us prior to your scheduled appointment to reschedule for another time within the same week. If you don’t reschedule, you will be charged for the service scheduled.